To prove that we really do understand the value of YOUR dollar, we're dropping the price of this routine to just $10! Longtime professional magician and popular magic author Scott F. Guinn is back, and he's hit this one out of the park! The Value of a Dollar (VOD) is a professional and commercial multi-phased routine with a borrowed bill. As you talk about the changing value of the dollar over the decades, the bill changes repeatedly, finally turning into a coin, which then turns into a lime in midair! The lime is given to the person who loaned you the bill. He cuts it open and inside it is a dollar bill, which he verifies is, in fact, the very one he loaned you! Scott's Working Pro's Bill in Lemon is one of his strongest routines (it's been the closer of his parlor/platform show for decades) and one of his best sellers. While VOD shares the basic premise of a borrowed bill in fruit, it has a completely different vibe to it. In fact, Scott specifically designed VOD for audiences who had seen his bill in lemon before. And VOD gets just as strong a response with those repeat audiences! No stone has been left unturned in this ebook. After some introductory comments, Scott tells you exactly what the audience sees, what you need and how to prepare everything, and where to perform VOD. Then he gives you every detail of how to perform it in crystal clear text with 33 accompanying photos. But he doesn't stop there. Scott goes on to give a very detailed explanation of WHY he constructed the routine the way he did, followed by other ways you can do it if you prefer them. Then, to aid you as you are learning the routine, he gives a barebones explanation followed by the complete script. Talk about the value of a dollar - you're getting it here, in spades! This powerful, practical, audience-pleasing routine comes to you in a 56-page ebook for the ridiculously low price of $15. But, to prove to you that he knows the value of your hard-earned dollar, Scott is offering a special bonus to early-bird buyers: For the first two weeks of its release, you can have VOD for only $10. When you consider that some of the "big names" are selling far less convincing and entertaining routines of this type for hundreds of dollars, you'd be crazy not to snap this up! 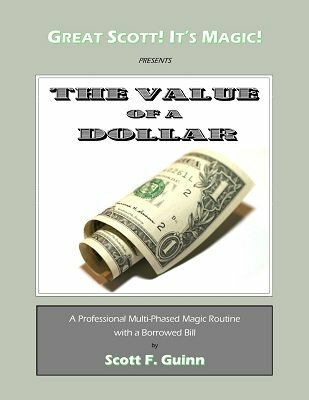 "Scott sent me a review copy of his new bill-in-lime routine, 'The Value of a Dollar,' and after reading it, I paid him for it. Given the solid value of this routine, I thought it was only fair. I am impressed by how visual and how easy this routine is. The only way this routine could be any easier would be if Great Scott were to perform it for you. Yet despite its ease, you have several very visual 'Wow!' moments that will play great on stage. If you're a more experienced performer and already have your own bill-in-fruit routine, do as Scott does, and use this routine for repeat customers. It's also food for thought if you're looking to add more visual 'gobsmacked' moments to your current routine. And Scott makes a very compelling case for the serial number method. Furthermore, he goes into the 'why's' of his routine, discussing the pros and cons of various methods. He offers several alternative handlings, as well as brief summaries of both the technical aspects and the patter used in the trick. These are great aids in learning the routine. I also like that the routine has a presentation, so that it has meaning. 1st edition 2015, 56 pages. Disgruntled sigh. I really wish the description tells you there are additional purchases of items (a gimmick, and a small list of other things) without which you can't perform VOD -- not to mention a more-than-usual amount of prep work. I don't mind having to get more things than the actual effect/method contains, and I happen to enjoy more DIY effects -- but neglecting to tell the customer what is really required is bad form. Scott Guinn is a very clear teacher, he gives ample alternative methods along the way, and I love his light-hearted style of entertaining patter. I'm disappointed by sin of omission in the description. I just got this e-book and it is a great routine. There are many instances of magic and a lot of opportunities for byplay with the audience. Scott gives you everything. He shares his patter, his jokes (guaranteed to get laughs AND groans! ), and, best of all, he explains why you do each part of the effect the way you do. He also gives you options for different ways to perform the effect if you don't want to do it exactly like he does or don't have the utilities he recommends in his presentation. This routine definitely teaches you the Value of a Dollar!